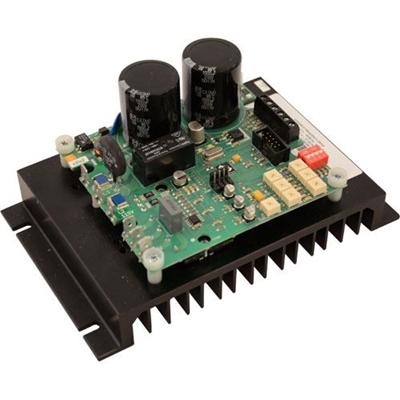 The ACF series is a microprocessor based variable frequency drive. These drives look and act like DC drives, meaning quick and easy setup without any programming. These drives are equipped with user adjustable trim pots to set Max. Speed, Min. Speed, Slip Comp, Boost, TQ Limit, Accel and Decel / Injection Braking parameters. ACF100 series models allow 115 VAC in and 115 VAC out. ACF600 series models allow 230 VAC in and 230 VAC out, but are also equipped with a unique voltage doubling capability that allows you to run a 230 VAC motor when only 115VAC single phase power is available. While the input is single phase, the output can be single or three phase for all ACF series drives. The drive’s internal carrier frequency can easily be changed from 16kHz to 1.6kHz to minimize switching losses or reduce electrical interference. Stopping methods include coast to stop or DC injection braking. Incorporated into the design is a microprocessor which provides flexibility of creating custom programs that can include specific user setting for OEM applications. These full featured and compact AC drives are the perfect choice to run any 3 phase, and some single phase motors, rated at 4 amps or below.